Our curling momentum continues to go strong, with our 5th consecutive sold out Learn To Curl session this year. The next couple of sessions are virtually sold out already as well. Not only that, but the interest in curling is far reaching, because we had another out of town group come up, this time from Louisville. A group of 16 , mostly first timers, came and enjoyed themselves. They are now looking to form a team or two in our upcoming inaugural league. Bonspiels are a great way to travel and enjoy the sport of curling. Taking your team on the road, meeting new people and seeing new places is one of the cornerstones of curling. Brockville is a great place to visit along the St. Lawrence River. Having worked at the Brockville Country Club for 6 years, I can tell you they put on a great event. Calling all University of Cincinnati, Xavier, Northern Kentucky, Miami and Dayton Students!! Bowling Green State University has announced their St. Patty's Day Bonspiel, March 16th and 17th. The flyer is attached here (BGSU Spring Bonspiel 2013) and if there are any local college students who are interested please let us know. We can train you and connect you to other curlers. It is guaranteed to be a good time! 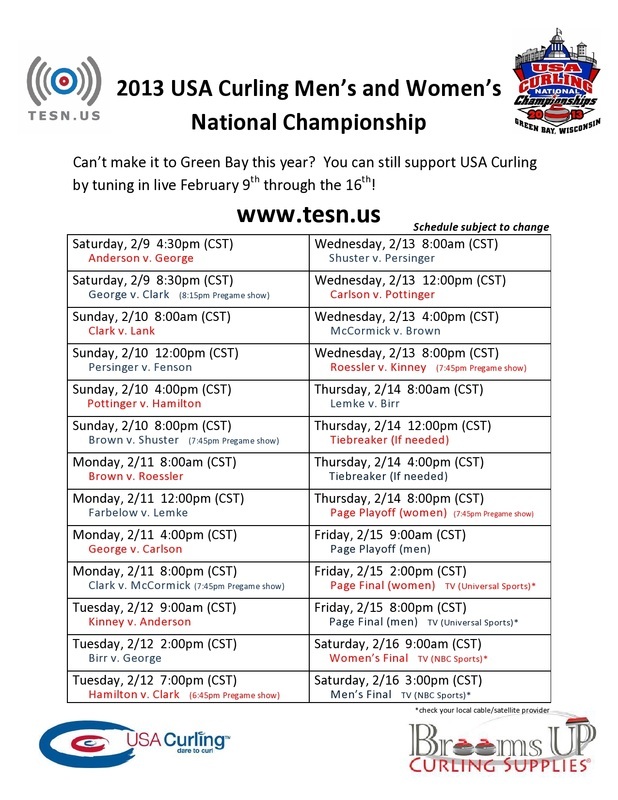 The 2013 USA Curling National Championships start Saturday February 9. There will be an online broadcast of up to 4 draws each day. The entire schedule can be seen below. You can watch the broadcasts compliments of the 12th End Sports Network, and can be viewed here. The Semifinals and Finals will be shown on NBC Sports. Time and dates can be found here.